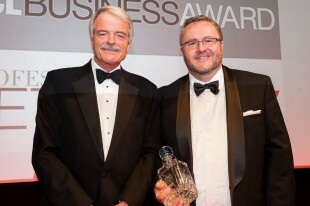 The UCL Business Award was presented to Professor Pete Coffey in recognition of his efforts with the London Project to Cure Blindness; a research programme which aims to develop a cell-based therapy to treat age-related macular degeneration (AMD), and particularly the licence secured with Pfizer Inc.
“Our partnership with Pfizer was set up in 2007 with the aim to take a discovery science project – one of using stem cells for the treatment of eye disease – into the clinic within a five year period,” said Professor Coffey, who works as part of the UCL Institute of Ophthalmology. “We are now going through the process of clinical trials and once we’re sure they’re effective then we can go to the European Medicines Agency and, from there, to our own regulators in the UK. “We wouldn’t have gotten where we are today without our partnership with Pfizer; partners who will actually give us the opportunity to create a therapeutic,” Professor Coffey went on. 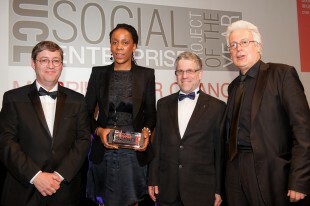 Mapping for Change, UCL’s first Community Interest Company (CIC) was awarded the UCL Social Enterprise Project of the Year 2013. Mapping for Change is one of the first successful social enterprises developed from the research and community development, public engagement projects conducted at UCL. Its vision is to promote a future in which communities are empowered, sustainable and resilient. People involved can make a difference to their local area through the use of mapping and the applications of geographical information .They offer participatory mapping services to voluntary & community organisations, business organisation or government bodies. Mapping for Change has not only demonstrated an innovative model of social enterprise but also a brilliant example of citizen science – science is by the people and for the people. More importantly, by sharing their experiences and knowledge, Mapping for Change has inspired and helped many UCL members of staff and students and people outside UCL to take on the challenges and opportunities of social enterprise as an important way to contribute to wider society. Co-founder and Director, Louise Francis, said “It is a great honour for Mapping for Change to have received this award and to be recognised for the work that we’ve undertaken over the last few years. One of the most exciting challenges comes from the communities that we work with who continue to push us to find novel ways in which we can support them to address a variety of social and environmental issues through the application of mapping“. The UCL Business Award and Social Enterprise Project of the Year 2013 came as part of the sixth annual UCL Awards for Enterprise, which celebrates the exciting new business ideas of student and graduate entrepreneurs – ranging from Bebe Mtoto, a company offering baby harnesses to PhotoSynthesis, a company whose business idea is clip-on smartphone photo printers – as well as showcasing the entrepreneurial activities of staff and sector-leading partnerships between UCL and the business community.